BACKGROUND: The origins of this handgun are dated back to the 1980s activity of the firearms manufacturer named SITES SpA. Located in TURIN, northern Italy, SITES had as the chief engineer a man called ROBERTO TEPPA, who's now working for the Swiss-based gun engineering studio called "THOR Projects", and whose projects are now being manufactured by MODULO MASTERPIECE, a new Italian firearms maker, founded in the year 2002 and located in Turin, which has "picked up the heirloom" of SITES. SITES launched in the early-to-middle 1980s the compact semi-automatic pistol called "SITES Resolver", whose primary task was the self-defense. In Italy, the CCW market is not wide. If one is over 18 years of age, if he has no criminal records and is mentally sane, and if he has not refused to do the Military Draft Service (until its abolition in 2003) for "Objection of Conscience", it's not hard, in this Country, to obtain a firearms license for uses OTHER than the concealed carry. Up to an overall of population of 60'000'000 persons in Italy, and counting about half of them being eligible for gun ownership (others being excluded for reasons of age, mental health or criminal records), approximately 10'000'000 Italian citizens have a license that entitles them to the legitimate gun ownership for sporting, hunting or collection purposes, not to mention the number of them who have a simple "Gun Permit", a police authorization that allows the purchase and the detention of ONE SINGLE GUN and NOT MORE THAN 25 ROUNDS FOR IT for the sole purpose of home defense (the gun detained under such permit can not be carried outside of one's housing for any reason); also other persons who have a similar permit to own heirloom guns are to be counted out. In conclusion, the number of gun owners in Italy is high if compared to other Countries in Europe. CCW is another matter. Only 37'000 civilians in entire Italy are entitled to a Concealed Carry License; such license (that has to be renewed yearly, while others are valid for 5 years at least) is released only to those who have a JUSTIFIED REASON, such as a dangerous employment, to carry a concealed firearm; open carry is forbidden, exception made for the Private Security Operators, who are licensed under a different Firearms Carry Permit that allows them open carry and has to be renewed every 2 years. Even if guns designed for self-defense are not forbidden to own for those who have another kind of gun license (and are widely used for range shooting), you will understand that there is not much market for a pistol like the SITES Resolver, which had no commercial luck. This, despite of its goods: it was made in stainless steel and lightweight alloy, with plastic grips, and was very instinctive in use. In fact, when the gun was launched, the SITES commercial stated: "Most of the people who need a gun for concealed carry, in case of emergency will have no time to trick with safeties: they'll just want a gun to be drawn, aimed at the target, and shot". The SITES Resolver was born after this concept. The gun was slimline and round-shaped to avoid snags (the only sharp edges in the overall design were the lower end of the magazine and the back sights in the versions which had them adjustable); and it was made with no external safeties. The SITES Resolver was a double-action-only, gas-operated pistol, whose main safety was the same DAO, with a provision for an extra-heavy first trigger pull. The light materials the SITES Resolver was made in to make it a carriable handgun called for light chamberings, and in fact the highest caliber it was prototyped in was the .40-S&W, but the version never passed the prototype stage. The SITES Resolver was inscribed to the ITALIAN NATIONAL FIREARMS CATALOGUE (thus making it legal to civilian ownership and trade in Italy) in calibers like the .22 Long-Rifle, the .22 Winchester Magnum, the .32-ACP, the .9mm-Ultra (9x18mm), the .380-ACP and the .9x21mm-IMI (.9x19mm-Parabellum/Luger/NATO for export); but none of these versions other than the .380-ACP one were marketed: in fact the .380-ACP and the .32-ACP remained the "top choice" on the Italian market for those who wanted a SEMI-AUTOMATIC pistol for concealed carry, since the guns chambered in them were light and easily carriable; those who wanted an higher punch in their guns, went to snub-nose revolvers in .38-Special, .357-Magnum or even .44-Magnum. With the advent of polymer-framed pistols the things have changed, nonetheless the SITES Resolver would have deserved better luck. The design languished until the demise of SITES; in the year 2000, the design was re-launched by VALTRO STOCCHETTA Srl, but no sales were made; at present time, the SITES Resolver is kept in catalogue by MODULO MASTERPIECE, who will manufacture and deliver it only under request. THE OFFSPRING: At the IWA expo in 1999, the Italian manufacturing firm of MATEBA, reknown worldwide for its series of "Autorevolvers", introduced a prototype pistol that was a scaled-up version of the SITES Resolver and was intended for duty use. In fact, the design of the SITES Resolver was a good one, even if it was poor in sales, and was worth more than one try. The weapon had been modified for the purposes of "heavy duty" by being all built in stainless steel and having a SA/DA working system, and was equipped with an external trigger safety; its status of prototype was clear anyway as everybody could see that the sample on stand had an external transfer bar. 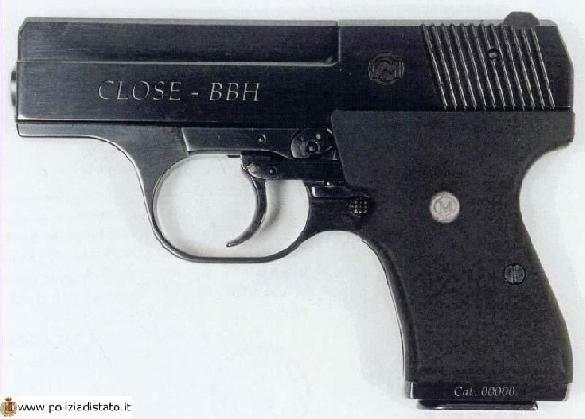 The project as seen at the IWA was never put in production; nonetheless, in the year 2000, MATEBA inscribed launched the "Close-BBH" pistol. THE FIREARM: The CLOSE-BBH series of pistols was a "meltin'pot" of old SITES Resolver features and new ones from the prototype seen at the IWA expo the year before. The CLOSE-BBH pistols were something like a "shrinked" SITES Resolver design, with no other purpose in mind but the self-defense and the concealed carry (the target practice with such small pistols is possible but not satisfactory). The CLOSE-BBH pistols were conceived as backup carry guns or for "light" self-defense, to be carried in pocket with high concealability. Again the lightweight alloy was the most used material in its construction, but this didn't afflicted the solidity of the design as, in order to reduce recoil and stresses for both the user and the structure of the gun in such a small design, and to increase carriability by reducing weight and width, the CLOSE-BBH pistols were chambered in very small calibers. As its own name states, the CLOSE-BBH pistol is designed for VERY close-range self-defense. The same calibers it is chambered in don't make it suitable for medium-range shootings (as could happen in police combat situations), nor to mention the "long-range" pistol shooting. The pistol has no external safety, nonetheless it is made in SA/DA (Double-Action first trigger pull, all following others in Single-Action). This is not the maximum of the safety for a carry pistol, but the solid DA first shot provides enough protection against accidental discharges; by any ways, the CLOSE-BBH pistol is conceived to suit the needs of those who might need to draw it, point it, and discharge it all in one time against a close target, so under this point of view a protection against accidental discharges should the pistol be carried with the Single-Action activated because of the first round having been fired was felt useless. But the feature of the CLOSE-BBH pistol that leaves the most to ponder is that it has an external transfer bar. the market for such items is not wide in Italy since most of those who carry a gun concealed for self-defense purposes wish to rely in more powerful items, while Private Security Guards often carry both one pistol and a shotgun or a rifle-carbine, and police personnel is not allowed to carry backup guns nor any kind of non-regulation firearm while on duty. After just two years, MATEBA dropped it from both production and catalogue. TECHNICAL SPECS: CALIBER: .22-Lr / 9mm-Police (.9x18mm) / .6'35mm "Browning (.25-ACP) / .7'65x17mm "Browning" (.32-ACP) / .9x17mm "Kurtz" (.9mm "Browning Short" or .380-ACP) CAPACITY: 7 rounds magazines on all models, with possibility of 8th round carry in magazine TOTAL LENGHT: 158 millimetres on all models BARREL LENGHT: 105 millimetres on all models RIFLING: 6 grooves, RH, on all models WORKING SYSTEM: Semi-automatic, gas-operated, SA/DA WEIGHT: n/d NUMBER OF INSCRIPTION TO THE ITALIAN NATIONAL FIREARMS CATALOGUE (CatNaz): 12401 (.22-Lr version) / 12400 (.9x18mm-Police version) / 12399 (.380-ACP version) / 12398 (.32-ACP version) / 12397 (.25-ACP version) MANUFACTURER: MATEBA srl (MACCHINE TERMO-BALISTICHE / MECCANICA VALTECH) Via Villa Serafina 2/B 27100 Pavia - Italy TEL: 0382/47.05.97 FAX: 0382/47.21.18 URL: http://www.mateba.it (under construction at this moment) E-MAIL: info@mateba.it STATUS: Out of production IMAGES: http://www.poliziadistato.it/pds/arm...401&t=d&zoom=1 MATEBA Model CLOSE-BBH, right side view http://www.poliziadistato.it/pds/arm...401&t=s&zoom=1 MATEBA Model CLOSE-BBH, left side view All images refere to the version in .6'35mm "Browning" (.25-ACP). 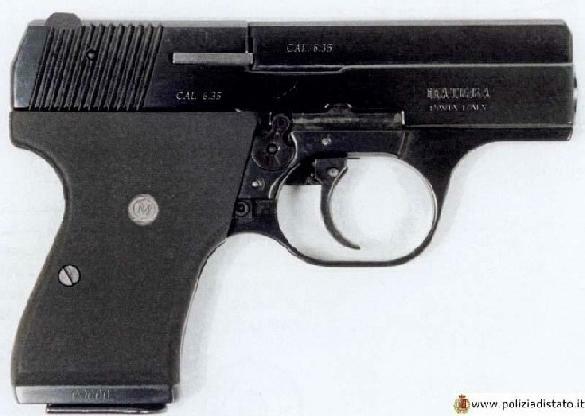 The above-attached images come from the website of the Italian National Police, hosting the Italian NATIONAL FIREARMS CATALOGUE; the pictures therein hosted were taken from Italian law enforcement officials and are made of public access for informational purposes, them are thus not protected by any kind of copyright and their reproduction is thus free purported that the Italian National Police logo on them is maintained.